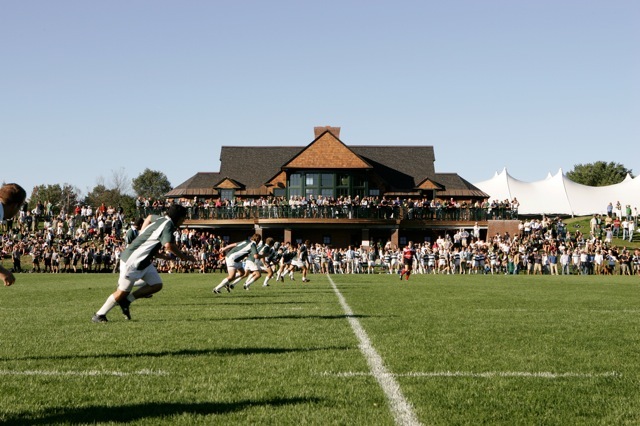 Providence, RI – Dartmouth Rugby travelled down to Brown this past weekend to participate in their third game of the Ivy season. The weather in Providence was beautiful, but perhaps windy, which made for a strategic kicking game between the two sides. The Big Green started out the competition strongly and did not look back as they stormed to a 76 to 29 victory over the Bears. Dartmouth began the first half with the wind behind their backs and used the advantage to play a highly territorial game, frequently kicking the ball deep into the Brown half. After a matter of minutes spent in Brown’s “red” zone, Ollie Engelhart ’18 noticed an opening in the defensive wall beside the ruck and burst through before distributing the ball to Benji Hannam ’18 to score. The next two tries of the game came from Andrew Zhu ’16 after the forwards had worked hard to turn-over the ball in contact and created space for Zhu to penetrate the defensive wall. Co-captain Ryan Maguire ’16, starting for the Big Green for the first time since dislocating his shoulder in the spring, scored two wonder tries as he used dummy passes, quick footwork, speed, and kicking finesse to beat defender after defender. Other stellar performances came from Co-captain Erik Warnquist ’16 and Ian Sullivan ’18 as they relentlessly tackled Brown runner behind the game line and were instrumental in turning over the ball. The Big Green travels to Penn and Princeton this Friday to participate in a double-header weekend. The team is looking to continue their unbeaten run in the Ivy League.